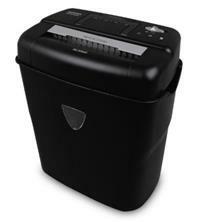 The Aurora AS1018CD shredder will shred a variety of materials including paper, small paper clips and staples, credit cards and CDs. Featuring a P-3 security level, paper is shredded into 4.8 x 37mm pieces and the shredder can handle up to 10 sheets at a time. The unit comes with a number of handy features including a safety cut out when the head is not placed correctly on the waste bin, reverse function, an overload LED indicator, a large viewing window so you can see if the bin is getting too full and an integrated carry handle for easier transportation and head removal. Suitable for home or small office use, this shredder is well suited for a range of shredding requirements – and it's very handy if you also need to shred occasional CDs and credit cards.